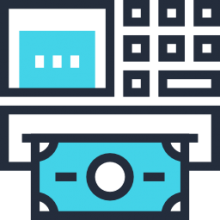 Money counting machines provide an easy way for cash-heavy businesses to process and count large amount of dollar denominations (Source). It's important to note that these counters cannot just be loaded with indiscriminate amounts of cash and then spit back the value to you (Source). What they do is get the number of bills in a stack of cash. So you will have to sort the $1s, the $5s, the $20s and the $100s before loading them into the machine, which will count them, and then you can do the math or load them into a hopper to do it for you (Source). One of our favorites that we examined was the G-Star Money counter that comes in standard, deluxe and elite versions. One difference between the models is that the Standard model can work up to 2 continuous hours, processing 1,000 bills per minute, while be the Deluxe can work up to 4 continuous hours, processing 1,200 bills per minute and the Elite can perform for 6 continuous hours, while processing 1,200 bills per minute. The G-Star counts the amount of bills, not the denomination. So if you put in 20 $20 bills the machine will just say "20". Most users use these machines by first sorting the money, separating them into piles, and then entering the piles separately into the machine for counting. We should also point out that the Hardware Factory Store counter will actually count USD, Euro and other currencies. That said, let's take a look at 5 of the best-selling money-counting machines on the market today. 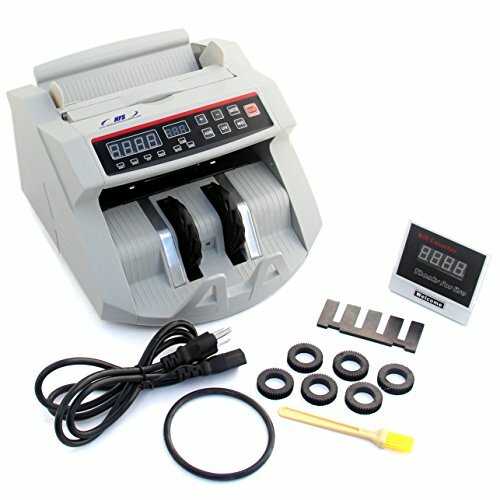 The money counting machine offered by G-Star Technology is well-made, accurate, and effective. Users love the easy operation mode and the price, but some do note that it doesn’t count the amount of money, only the number of bills. With a size of 14″ x 13″ x 10 ″, this bill counter has ultraviolet and magnetic sensors for counterfeit detection, an easy-to-read LED display, and an automatic self-testing ability. 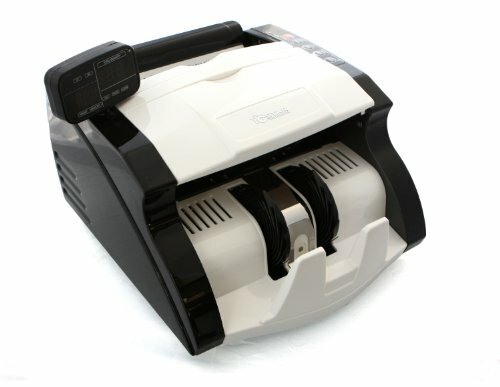 The G-Star money counter is available in three different models – standard, elite and deluxe and it can count 1000 – 1200 bills per minutes, and it uses less than 90W when it’s working. As a whole, users agree that this automatic money counter is fast, accurate, and efficient. One buyer mentions that the bill counting machine does an excellent job of detecting fake and damaged bills, and it’s very useful in his shop. He highly recommends it to anyone looking for a reliable currency counter. Another reviewer shares that he likes the smooth, elegant design and that that the counting machine works far better and faster than he expected. A happy user comments that the cash counter counts rarely makes mistakes and that it’s an excellent way to save time. However, some customers have complained that the money counting machine stopped working after a couple of weeks and that they had some problems with the counterfeit detection feature. Some also complain that the machine smells horrible. If you are looking for a fast and reliable counting machine, you might take a look at this currency counter offered by Cassida. Users love that it can calculate the value of the bills, but some do note that the machine often jams. With a size of 15″ x 15″ x 12″, this bill counter can count up to 1300 bills in a minute, and it has ultraviolet and magnetic sensors for authenticating bills and infrared sensors for half, double and chain banknotes. The Cassida currency machine comes with four different operating modes – count, add, batch, and add + batch, and if you encounter problems the machine has a self-diagnostic system and an easy-to-open front cover. In general, users are pleased with the accuracy and the fastness of the Cassida money counter, but some have complaints regarding its performance. A happy buyer shares that this bill counting machine is well-built, quiet, and it counts money so fast that it’s a pleasure to use it. Another reviewer mentioned that value feature saves him a lot of time, and he hasn’t had an incorrect count so far. The customer also states that the cash counter is easy to use, solidly built and the batch feature is convenient when he wants to have a bunch of 10’s. A user also mentioned that he was surprised how well the money machine worked and that it worked well with used bills. However, some customers have complained that it jams regularly and that it doesn’t detect fake bills as it should. Some people also note that they the error messages are not easy to comprehend and that it doesn’t have a mixed bill feature. This currency cash counter machine offered by Hardware Factory Store is efficient, reliable and suitable for anyone who has to deal regularly with large stacks of bills. Users love the price and how fast it counts, but some do note that the HFS counter doesn’t add up the bills. With a size of 13″ x 11″ x 8″ and a weight of 13 pounds, this bill counting machine can count up to 900 notes per minute, and it has a self-diagnosing feature, ultraviolet and magnetic sensors and an external display monitor. You can also use it to count different kinds of currency, so this is a useful cash counter to have around if you regularly deal with foreign currency. In general, purchasers are satisfied with the efficiency and accuracy of the HFS currency counter, but some have complaints in regards to its performance. A happy buyer comments that since he got the HFS counting machine he does his counting in a matter of minutes, not hours and it works great for Venezuelan currency. Another reviewer mentions that he likes that the cash counter comes with extra parts and that it’s an invaluable tool for detecting fake bills. A user shares that he uses this money counter for Brazilian Real with no issues, and it counts the bills precisely and accurately. However, some customers have complained that the machine works too fast and it doesn’t give you enough time to set the banknotes properly. Some users also state that it will miscount by one to five bills, and they have to repeat the count several times to get it right. If you regularly have to count large amounts of money, you might want to try this cash counting machine offered by TriGear. Users love the different modes available, but some do note that it’s heavier than they expected. 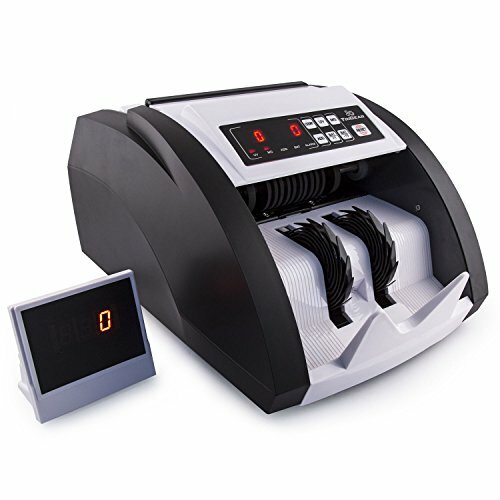 With a size of 16.5 x 10 x 13.5 inches and a weight of 15.6 pounds, this bill counting machine has an external counter display, a counterfeit money detector, an easy-to-read and use LED display, and it can count more than a 1000 banknotes in a minute. There are three working modes available: count, add and batch, so this could be useful for anyone who wants an inexpensive counting machine. As a whole, buyers are happy with the functionality and usefulness of the TriGear bill counting machine. A user commented that this is a heavy, solidly built counting machine, and he was extremely surprised by its quality and accuracy. Another buyer mentions that it is very easy to use this cash counter and you don’t even have to read the instructions to figure it out. A reviewer also states that the TriGear bill counting machine is perfect for any small business owner and that it takes him 30 minutes to do his counting instead of several hours. The customer also points out that the handle is very useful if you want to carry it around. However, some users have complained that it jams occasionally and that it sends bills flying around. A purchaser also complained that it stopped working after two days of use. This currency cash counter machine offered by BlueDot Trading is reliable, well-built and accurate. Users love the lightweight, portable design, but some do note that the manual is not very helpful. 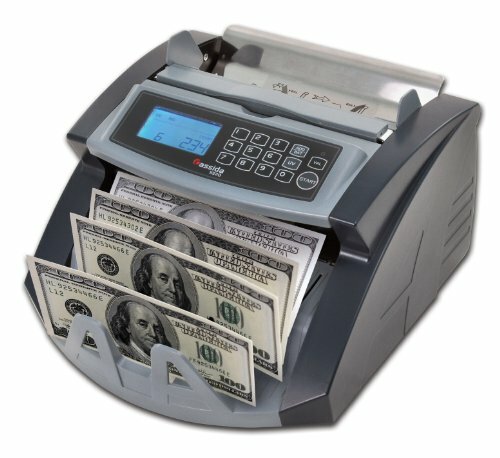 With a size of 10″ x 6″ x 6″ and a weight of 11 pounds, this cash counter tool has an automatic UV and magnetic sensors for detecting counterfeited bills, an automatic half-note detection, and it has three modes – count, add and batch and an option for self-examination. While it’s suitable for the majority of the world’s currency, this money machine counter won’t sum the value of the bills. A pleased user comments that he uses the BlueDot counting money machine every day and it’s no longer a chore to do his counting. The reviewer also states that the machine never misses a count, and he recommends it to anyone looking for the best cash counting machine. Another buyer shares that the cash machine is fast, quiet, very accurate and he has no issues with it even when he uses it extensively. The user says that he was skeptical due to the low cost, but in the end, he was extremely satisfied with its performance. However, some customers are disappointed that it doesn’t recognize denomination and that it starts to automatically count the money before they have the time to align the bills properly. Many people look for money and counting machines at Walmart, Staples and Target, but sometimes your best bet is to purchase one online because you can often find a better price there instead of in a brick-and-mortar retail store. The standard, deluxe and elite models are also configured differently, with the deluxe and elite possessing forward facing LED displays. These are fairly quiet machines, working at lower than 60 dB. This is because they are equipped with ultraviolet and magnetic sensors which enable the G-Star money counter to function at very low volume levels. Buyers say that for the price, you're not going to find a better deal. One reviewer who works in the restaurant industry and deals in a lot of cash transactions says that it is crucial for their job when they have to count thousands of $20 bills in an evening. They say that most commonly they will run through each cash amount twice to make sure there aren't any errors. They told us that in the hundreds and hundreds of times that they've used it, it's only produced an error once. Other reviewers say that it's excellent at identifying damaged and suspicious dollar bills, with a count that is festive usually accurate. One piece of advice users had was that since these bills kick up a lot of dust as they're being counted, you will want to have a small Dustbuster around to clean up the mess after you've counted the cash. Another user who works in a dollar store has to process a lot of single dollar transactions says that these machines are a true lifesaver. Oftentimes his customers will pay him in stacks of one dollar bills, which produces by the end of the day an enormous pile of cash that needs to be accurately counted. All of that said, the functionality of these machines is blessedly simple. Users say that it is effective at what it is designed to do- feeding it huge stacks of bills and having the machine quickly and accurately detect how much cash you have. As we have seen, this is essential to match receipts to bills, preventing tedious hand counting, and making it easy to perform deposits at the bank, especially when you need to see how many bills of each denomination you have. Another option is that we surveyed users about was the Cassida currency counter. This 14 lb. money counting machine is designed to simplify your cash-heavy business life featuring intuitive controls and a variety of automatic features that make it simple to operate out of the box. Infrared sensors are engineered to be able to detect a variety of bill discrepancies that include chain notes, double and half denomination issues. Whenever a counterfeit bill is detected by this currency counting machine, it will spit it back out into the stacker so that you can inspect and discard it. Users say that it makes income calculations in retail stores much simpler. One buyer that we spoke to said that before it would take many hours of work, but after purchasing this currency counter it only takes a couple of minutes. Another reviewer said that it is sturdily constructed, pretty quiet while in operation, and does all of its work super fast. Be forewarned, though, that it doesn't actually sort your bills, so some buyers have purchased other machines to do that for them. When we spoke with the manufacturer, they say that their currency counters are designed specifically for US dollar paper money. In addition, they are engineered to work with both new and old printing styles of denominations and are scrupulously tested against a variety of different currency conditions. They also said that while the counters can be modified so that they can interpret other currencies, it does require modifications to the feed gap as well as the density settings to accurately assess currency that is not USD. Yet another option we examined was the Hardware Factory Store money counter. This 13 lb. counter ships with 6 replacement wheels, 1 replacement belt and a cleaning brush- all of which are handy to keep around to perform maintenance on your machine. It is equipped to process 900 banknotes in a minute, features counterfeit detection sensors that are magnetic as well as ultraviolet, and features a forward-facing external display monitor. Reviewers are generally pleased with this currency counter, saying that they have used it for a number of years, running thousands and thousands of physical bills through the counter and finding that it is an exceptionally accurate unit. Other buyers say that it is a very solidly built money counter, performs its work very fast, and it is equipped to count any type of currency, that is not restricted to a preset range of bills. The only problem is that this unit seems to have, according to the reviewers we spoke to, is that it will often begin counting the bills before you placed all of them in- but this is a minor quibble. This is one of the few machines equipped to count different currencies users saying that it works very well with Brazilian Real bills. The TriGear money counter is another solid option that comes in premium and classic models. Users say that the ultraviolet and magnetic scanning sensors are accurate, helping them to detect how many bills are in a stack and providing an add up mode as well as a batch counting mode. If you are in the market for a cash-counting machine, check out some of the money counters that we have reviewed. Also make sure that you read the comments on the individual product pages to get a sense of what other buyers are saying.